2. Add all the other ingredients and mix well and keep aside for 1/2 hour. 3. Heat a non stick pan. Drizzle a tbsp of olive oil and cook/roast the marinated potatoes open in the pan till it turns brown .Drizzle oil if needed.Serve hot. wish i could dig right into them reshmi...would taste lovely wit rasam and rice! smack! perfectly roasted potaotes...love the colour..
potato is my all time fav...awesome dear....luv the clicks.. Seriously cant take my eyes from ur irresistible click,super tempting roast. Love the clicks, the potatoes look so perfectly done, first visit to your space, you have such good recipes like the ilaneer shake, following U, do drop by mine sometime.. 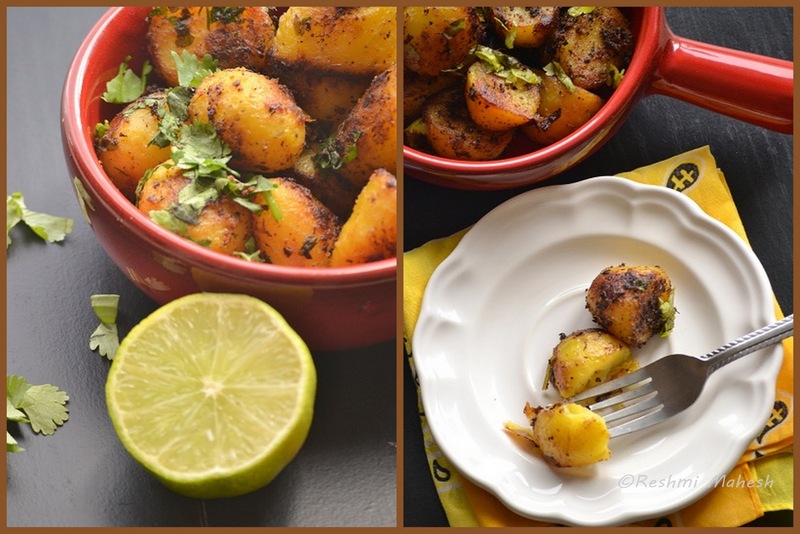 Simple and delicious looking potatoes..
Lovely potato roast..spicy and delicious,adipoli clicks. yummy potato roast, looks super delicious..
wow...potatoes are my family fav veg...love anything with potatoes n this roast looks so tempting and nice recipe too...clicks are awesome n well presented too!! Woooow......feel like grabbin the bowl of these perfectly baked beauties. wow very tempting and mouthwatering potato roast !! Yummy and spicy potato roast. That is simply irresistible! !I wish i cud grab some!! The little red pan is soo adorable! how are you? here after a long time and this Alu recipe is perfect for my winter evening. WIll give a try. Let me see what all I have missed. I am off blog these days. Perfect!! Can't find a better word to describe. Beautiful clicks. i should def try this one.. looks really yummy :) am so glad you dropped by my space.. else would have missed seeing & learning from u ! :) B/w how dod u manage such amazing clicks..would love to learn from ya. baby potato roast looks delicious love to try with some curry. toooooooo tempting!!! Love potatoes made this way! I too follow this method sometimes to make the potatoes and they become so tender inside and very crunchy on the outside. Perfect potatoes! Luks so delish n Yumm-made. Nicely flavored.